On December 17th 1970, David Seelhorst had just returned home from Vietnam. The United States Government rewarded him for his service with a Check for $3400.00 Dollars and an Honorable Discharge. While away overseas he Like many other soldiers talked about what kind of car they would get once they returned home. He wanted a Z-28. He knew nothing about Yenko, or COPO cars just what he remembered from when he was last in the States. He expressed his wishes to a friend who told him that he thought he knew where a Z-28 was at a used car parking lot. it was 9:30pm and the place was closed but they went down to look anyway. He was not prepared for what he found. an Orange 69 Camaro with a Black vinyl top. 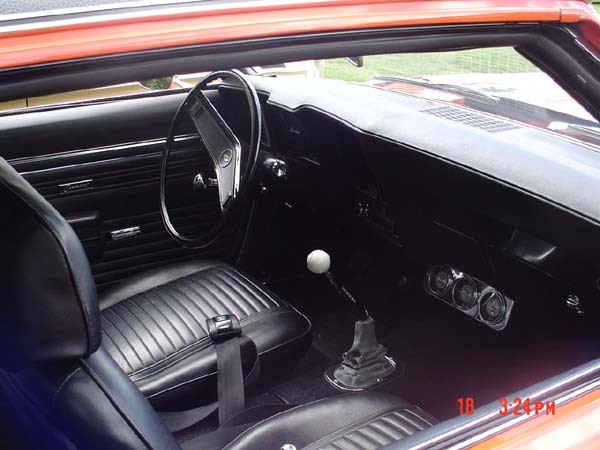 and Stripes that he had not seen before with YENKO S/C and what is this? 427 Emblems?? "In a Camaro? ", He thought! they popped the Hood and that was it! Love at first sight. he was back in the morning waiting for the Salesman to open the Door. For the Sum of $2900.00 Dollars, He bought his Dream Car Camaro and has never looked back! fast forward to September 2002. I had a 1968 GT500 that was in semi rough condition. a fellow Shelby enthusiast has an invitation only party once a year. your classic Car in attendance is the price of admission. a great gathering as fall is just around the corner and the days are getting shorter. Men and women Eating and drinking and everybody talking Cars! "Did you see what just pulled in?" is a common sentence heard thruout the day. I pulled in overheating and embarassed to all heck. but you play the cards you are dealt and it turned out to be a great opening for evryone to help the new guy in this crowd. as I looked around at all of the Shelby Mustangs, I noticed this Mint Camaro at the end of the row. "what is a Chevy doing here I thought?" as my Car cooled off and I went through the rows of cars, I eventually came upon my first encounter with a Yenko Camaro. The Car's odometer shows an original 48,000 miles. it retains 85% of it's original paint! 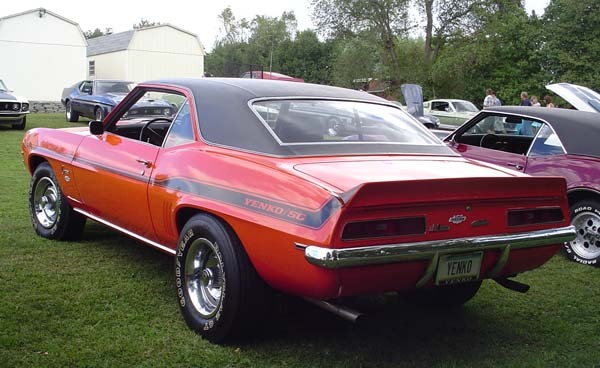 even the Body Stripe Stickers are original including the Yenko Tuned window sticker. Yessirreee This is something here. no wonder this unique piece is invited! I met the owner who told me his wonderful story of How he aquired this Car. and more importantly, How he kept it! After he took it off the used car lot back in 1970, he used tis Car for Transportation and enjoyment. He added Headers and traction bars. a Hurst Super Shifter (Notice the original Hurst Equipped emblem he installed after he put a Super Shifter in the car) The Car came with the 15"x7" Rally wheels. in 1974 He started to Drag Race the Car every weekend at Maple Grove Raceway. with Slicks, Open Headers and 4.88 Gears in the BE Rear, he was Running in the Low 11 second Zone! At the end of the season and the car a mere 5 years old, He say's He started thinking that this Car was special. It was time to Stop Racing and begin caring for this car. He got Married and settled down. In 1982 he says he was House shopping and thought about selling the Yenko Camaro. Word spread and a Quick wanna be Buyer appeared with Ten thousand Dollars in Hand! Dave realized that there were other ways to get money. Good Move on his part! in 1983 His Daughter was born and as any Parent knows Priorities get pushed aside as Baby comes first. So in the Garage the Car sat. from 1982-1992 He would go out in the garage and do little things from time to time. eventually he took the front end apart and removed the Subframe cleaned and Painted everything nice. He had the Original L-72 427 Engine rebuilt. it was Bored .30 over and Put back together Stock. When he finally did pull the Camaro back out of the garage, he went to the HatboroCar show. He placed in the top 50 Cars out of 500 for three years in a Row! David Seelhorst has done the almost Impossible. He Survived a Dangerous War overseas, Came home and Bought one of the nost sought after Muscle Cars in the World, and Has managed to Keep it all these Years in Excellent Condition. While the world may look at him as the Second Owner, I see the First guy as someone who just held David's Place in LIne until he could get there! 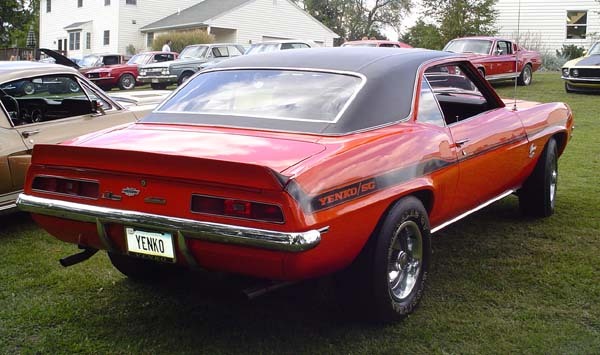 Congratulations Dave as You and your Precious Yenko Camaro are truly "One of a Kind"! I apologize about the tardiness of this month's feature, as I've had it ready for some time now thanks to "12bolt", but I hadn't had the time to update the static pages yet...but anyway, now everyone can get a glimpse of a freakishly cool car that few folks know about! Enjoy!! Great story and car....and a 35 year love affair. David, I could only imagine in my wildest dreams how you felt when you looked at the 69 Yenko on the used car lot for the very first time. It must have been something, especially after you lifted the hood. It gives me goose bumps just thinking about it. My dreams were your reality. I applaud you for keeping the car for all of these years, and I also want to thank you for serving our country and fighting for our freedom we have here in the U.S. Welcome home. As for Mr. Winkler, the story was well written. Nice car and write up, too! Thahns for sharing it Dave and David! I've seen this car in person many times, and the only thing better than the car is hangin out with the owner! Dave has great stories of his life with this car, and he drives it regularly. The pics of it at Maple Grove Raceway back in the day are priceless - I seem to recall some pics of guys with something called 'porkchop' sideburns?